We went to the front, with our names on the list. Those who were strangers had turned into friends. It was an eerily quiet night in Funkytown as I walked from the car park to the old 21st Century nightclub. At the corner, a man wearing a flannelette shirt asked me something I didn’t understand. Perhaps it was because I’d been out of town so long, but what he was saying didn’t seem to make any sense. ‘What’s a round worth here?’ he asked, leaning deviously close to me. I noticed that he was clutching the remnants of a pot of beer he’d likely been tossed out of his last drinking hole with. ‘I don’t know what you mean,’ I conceded. I didn’t so I asked if he was talking about beer, because if that were the case, I wouldn’t be much help – I prefer spirits. Then I realised he could have been saying around and needing help with directions. I asked him to clarify if this was what he meant. He cursed, finished the last of the beer and tossed the glass to shatter in the gutter. It seemed I’d upset him, and as the lights changed, I quickened my pace. ‘Come on!’ he shouted now. ‘It is Wednesday night!’ I realised he may have been right, but was no closer to understanding his weird dialect, as he returned to a line of questioning regarding the value, or location, of rounds. It was a much emptier 21st Century than I have ever seen that I was allowed entry to, whilst the man following me had been kept outside by the bouncer. I’ve never seen 21st Century looking so desolate, but on stage a group called Bad Karma were playing, and literally wearing their hearts on their sleeves. It was as though the singer’s Sonic Youth t-shirt had seemed through the fabric and into his very being, and if one squinted just a little, Bad Karma could easily be mistaken for some pub rock side project that Thurston Moore has going on. To keep the pub rock vibe going, Heartless Vendetta followed. Pub rock isn’t usually my kind of scene, but Heartless Vendetta played it enthusiastically, turning what could have been a generic support slot into something enjoyable. They were followed up by the advertised support, someone called Aleister X. I’d never heard of him, but he bounded to the front of the stage to fist-bump me, and give me microphone props for my choice of Ramones t-shirt. He put on an energetic performance of a kind of electro-freestyling which was mostly poorly received by the crowd. I, on the other hand, found his initially bizarre-seeming foreboding raps kind of catchy. Dragging chairs onto the stage as props and shaking his fist in rage, I got the impression this kind of music would work well with an audience more familiar with the tunes, so it was perhaps a pre-emptive strike when Aleister X stuck around to give me a copy of his album later on. The stage had been cleared after the two support bands. The chairs Aleister X had carried onto the stage had also been removed, leaving only a microphone and an electronic piano. Before long, an introductory tune played which sounded like it had been written and performed by Aleister X too. A look around the venue confirmed that it hadn’t filled up much more during the support bands, and, for better or worse, it looked like Andrew W.K. would be playing to an audience that couldn’t be larger than fifty people. At the pinnacle of the introduction, Andrew W.K. ran onto the stage, disappointingly accompanied only by a backing track played by a disinterested looking roadie. I’ll admit, even without a band, I found myself jumping along to opener It’s Time To Party. By the end of the first song, Andrew W.K. had made the aforementioned invitation onto the stage, and that was all it took to get me up. 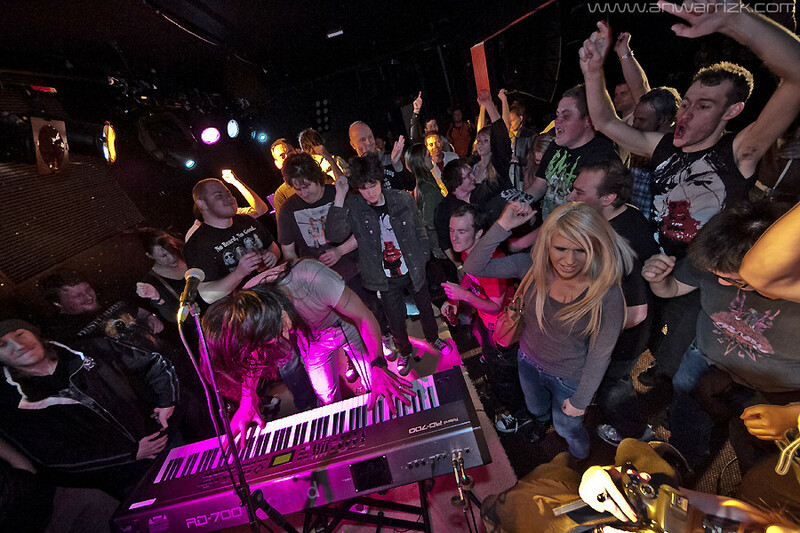 The rest of the audience followed suit, and the rest of the show was carried out as a giant sing-a-long, with Andrew pounding away on the piano, passing microphones around the audience whilst he posed for photographs and accepted drinks from fans, which he usually also passed along with the mics. The description of the tour, One Man Party, sums up the evening fairly well. With everyone crowded onto the stage shouting along to a tape, it would have been easy to confuse the scene with the lounge room of someone’s house party, and no more so than when I Love New York City quickly degenerated into a chant of ‘I love Frankston City!‘ Other songs tended to fade into obscurity, lost amongst the on-stage posturing and chanting. It wasn’t a bad night, but it can’t really be rated amongst other shows. It was more of an experience, and one that brought a room-full of strangers together and leaving with their arms around each other, talking about how to get in touch to exchange the choice photos from the maelstrom of the stage. It is something I’m glad I experienced, but now that I’ve been to a One Man Party show, I don’t think I’d ever need to go again. It had a lot to live up to, after Andrew W.K.’s show last year, which I ranked amongst my favourite gigs of the year, and it didn’t really manage to do that at all. It only really made me leave hoping Andrew W.K. would be back soon, and remembers to bring his band along too. Photo by Anwar Rizk. Gallery.